How To / A Year of Techniques / A Year of Techniques: Cables! Sometimes there are tricks in knitting that seem impossible. For many knitters, cables fall into that category—tangly, twisty, and confounding. Remember putting your face in the water for the first time at swimming lessons? How it was, all of a sudden, not a big deal? That’s what happens when you try cables for the first time—it’s one of those skills that you avoid until you make your first cable, after which you feel like you have joined the secret coven of the cablers. Jen Arnall-Culliford’s video tutorial, up top, explains it all for us: how to read a cable chart and how to work cables with and also without a cable needle—yes, friends, without a cable needle. It is one of the terrific moments in knitting: changing the order of your stitches so you can make them go wherever you want them to go. Sarah Hatton’s brand-new pattern for this tutorial is a total winner. 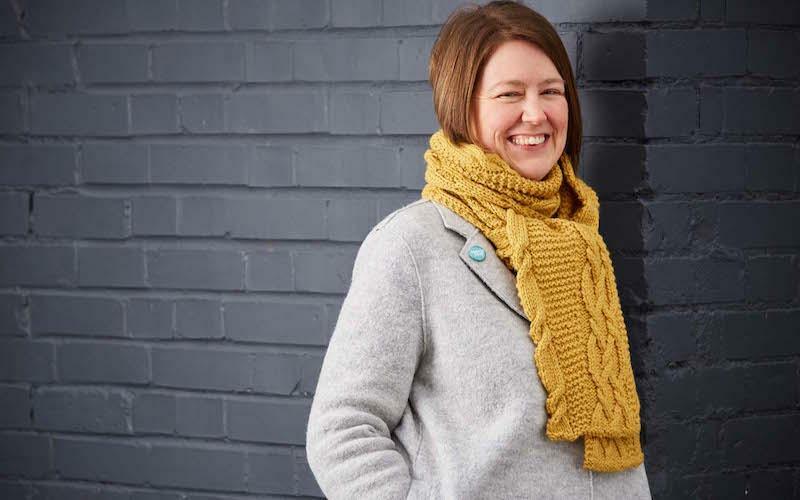 Yellow Wagtail Scarf provides a low-dose amount of cablework, but it provides constant repetition of a few cable moves so that you learn the rhythm of the twists. It even includes one of my favorite cables, a cable along the edge of the scarf. Neat! Dimensional! Cablewow! Get the pattern. If you have already bought your Year of Techniques ebook, this new Yellow Wagtail Scarf pattern has been delivered to your Ravelry library, ready to go. If you need to buy your Year of Techniques ebook, which includes all 12 patterns, and tutorials for the whole program, it’s available on Ravelry or from Arnall-Culliford Knitwear. The print edition is available in the MDK Shop. We find ourselves returning to this elegant book already to review a technique. Yay books! Get the yarn. Lorna’s Laces Haymarket is the yarn of choice this month, with three skeins required. Haymarket is 100% Bluefaced Leicester, a soft single with a quiet little halo. The six shades in the MDK Shop were created exclusively for MDK. Join the conversation. We’ll be over in the Lounge talking about the Yellow Wagtail Scarf in the topic “Technique Number 9: Cables!” And of course, the gang will be carrying on about it in the Year of Techniques Ravelry group. What a group! Love ’em! You know how teenagers think they can do anything? A purple cabled sweater was my very first project when I first learned to knit. I wish I had saved it – I bet those cables looked like a New England country road. Love this scarf! And love the tutorials! So cool, with the cable up the edge. I put cables into a pair of socks once, inspired by one of your blog entries about random cables without a pattern, but the tweediness of the wool didn’t show them up at all. Soooooo, I just put cables into one sock, and knit the other plain. No one has ever noticed. Wow, I’m going to have to watch that a few more times, that is a lot to comprehend! I did think it funny that she compared it to learning how to drive a manual transmission, something I never could learn how to do. Am I doomed to never learning how to read a cable chart and to never not use a cable needle. I hope not! That was a very apt analogy. I too have never been able to master a manual transmission, but I can do cables, and so can you. The video is very good. Just pull out some scrap yarn and start practicing. Jen, I immediately thought of that myself. I have had to rent automatic transmission cars in the UK, and it is now easy to do so. Imagine trying to drive a manual transmission on the “wrong” side! I’ve taken beginning swimming at least six times, and I still don’t like to put my face in the water. Cables, though? I love them, especially without a cable needle. Like Sherri, the commenter above, my first knitting project was a sweater with cables running up the front. Wish I still had mine, too! Any chance this will stand alone pattern?? I’d love to knit it!!! Absolutely brilliant. Will you continue to do these projects every month?